(Completed by Eugene Heiner). See History below. What does a turkey drive, a thirty-year feud, a lady in a clock, and a headless horseman have in common? The answer is DeWitt County. 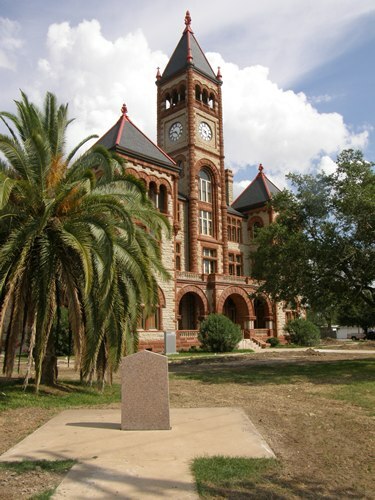 The present county of DeWitt, named for colonizer Green DeWitt, was created from parts of Gonzales, Victoria, and Goliad counties in 1846. 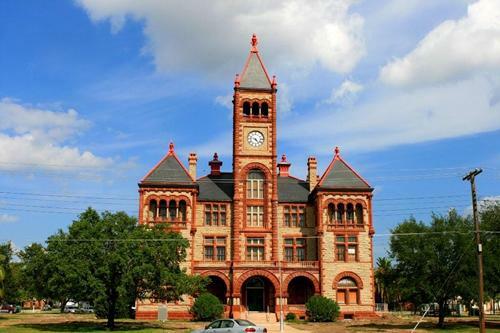 Since that time, there have been three courthouses in three different cities, including its present county seat, Cuero. 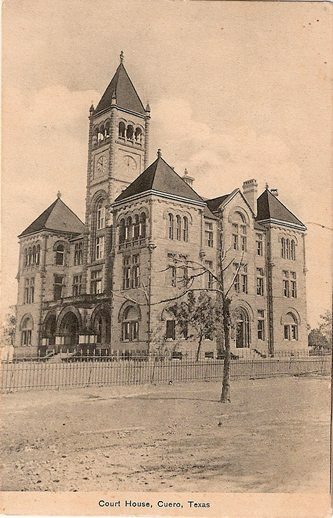 Somebody or somebodies didn't care for the second courthouse because on Sunday night, April 8, 1894, it was torched. 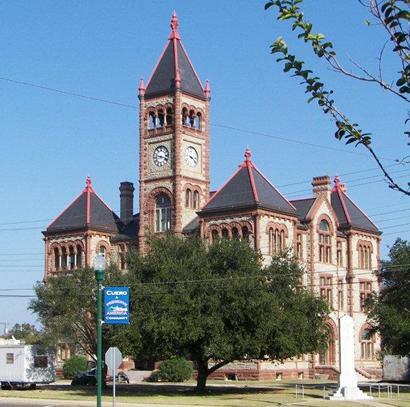 The Hallettsville Herald said it had been an eyesore to that beautiful city for many years*. The replacement building was definitely not an eyesore. But getting there was a challenge. 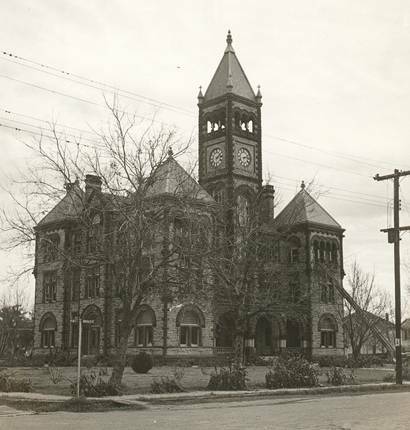 Acclaimed Austin architect A. O. Watson both designed and built the courthouse. He had quite a time funding it, however. 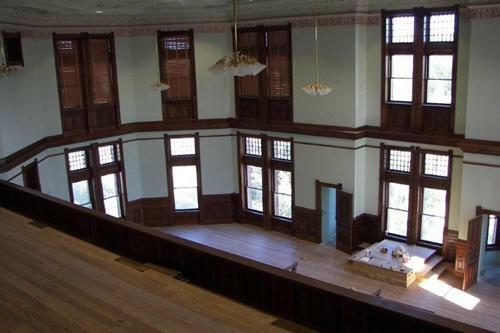 Finally in December 1896, the unpaid workers walked away, leaving the courthouse without a roof. Citizens complained. I guess it would be hard to hold court with rain beating down on your heads. Watson went broke on his "labor of love." Winter was looming, when in steps Eugene Heiner, who saw its completion. 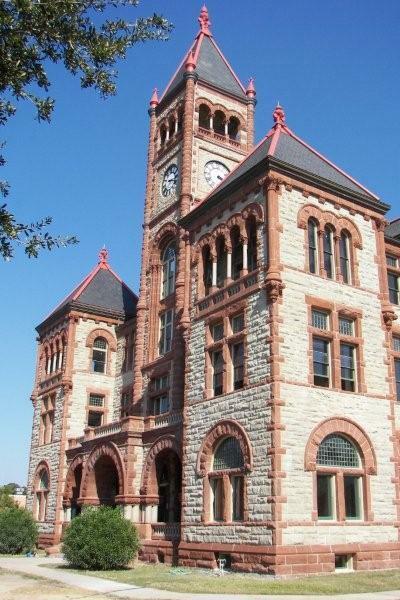 DeWitt County got not one, but two Golden Age architects constructing their courthouse. Thirty years later, one of the four lower finials fell. Officials feared someone might be killed if others fell, so all the ornaments were removed. 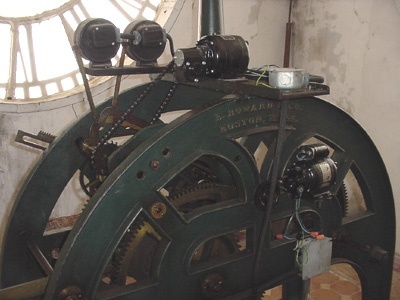 Legend has it that the lady in the clock had something to do with it, for right after that, she was gone forever. 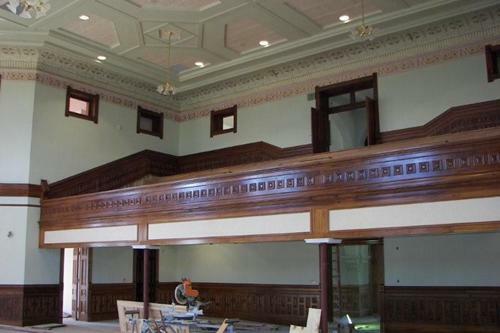 One of the original finials is kept in storage in the courthouse. I got a look at it, and it's taller than three watermelons stacked up on top of each other and fairly hefty. I wouldn't want that thing falling on me either. Another oddity is that one of the balusters on the second floor balcony above the Gonzales Street entrance is upside down. The workers noticed it, but they thought that no one else would. 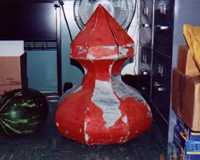 One of the finials that was removed shortly before the Lady in the Courthouse Clock disappeared. Now, the county has had its share of trouble makers. The most infamous ones are those who were involved in the Sutton-Taylor Feud. No one knows why this thirty-year fight started, but eventually over one thousand people were involved, including gunslinger John Wesley Hardin. 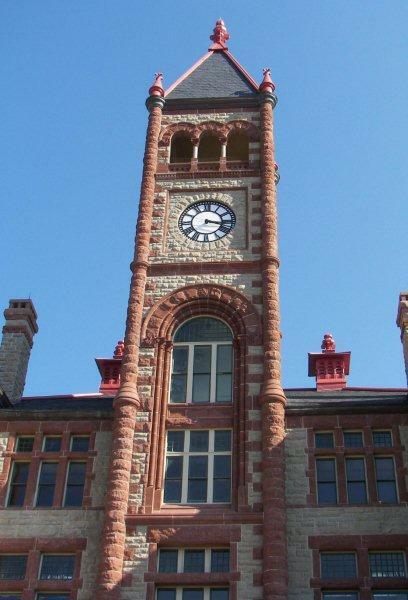 Records of this court case are on display in the foyer of the courthouse. The patriarch of the Taylor clan, Creed Taylor, was a former Texas Ranger, a Texas Revolution fighter, and cattleman. At one point, he and his Texas Ranger friend, Bigfoot Wallace, tracked down and killed a Mexican bandit who had been stealing horses and cattle for many years, including Creed's horses. Wallace made an example of this bandit, resulting in El Muerto, the headless horseman. Legend has it that this horseman, with its head dangling, can still be seen riding across DeWitt County during the darkest nights. You'll know when you see them because lightning flashes from the ghostly wild mustang's hooves and flames burst from the eyes of the severed head. Sounds like a wild ride. The cattle industry was big in DeWitt County from the late 1860's to the 1880's. Trail boss Thorton Chisholm from Clinton helped blaze a trail that has gone down in cow history as the Chisholm Trail. Before the end of the trail drives, over 5,000,000 Texas cattle walked to the railroad in Missouri or Kansas or to the ranges of Wyoming and Montana*. Once the cattle drives stopped, people started driving something else. As many as 20,000 turkeys have been driven down the streets of Cuero. Since 1908, these gobblers, which could have been our national bird, would trot from their roosts along main street down to the packing house. People soon started flocking to see them. 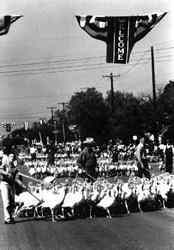 In 1912, the first Cuero Turkey Trot was held. Now, I'm not prejudiced against any birds, but you won't see any eagles trotting along together to their deaths. *Hallettsville Herald, April 12, 1894, page unknown. *The History of DeWitt County, Texas, 1991, p. 29.